I mean “refreshing” here in the sense that a dive into chilly waters is refreshing. I just finished reading Raymond Ibrahim’s Sword and Scimitar, a history of fourteen centuries of war between Islam and the West, and the effect is similar to the shocked-awake effect of a plunge into cold water. Not that I didn’t have a general acquaintance with the history, but one tends to forget the details, and the devil, as they say, is in the details. Ibrahim supplies plenty of those. Moreover, the details are so shocking that one is inclined to think that the devil was intimately involved in the centuries-long jihad against Christendom. Indeed, that’s exactly what many Christians of those times did think. 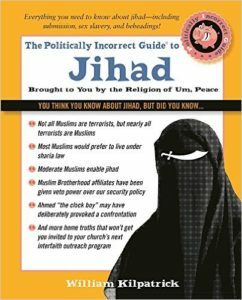 Muhammad and Islam were frequently referred to by popes and peasants alike as “demonic,” “diabolic,” and “satanic.” For their part, Muslims had a particular hatred of Christians. They considered the Christian belief in Christ’s divinity to be a great sin against Allah. Wherever Muslim armies went they desecrated and destroyed churches, broke crosses and statues, and made a particular point of violating nuns and torturing priests and monks. Despite the passage of more than a thousand years, the Muslim-Christian conflict was marked by certain constants. There is a remarkable continuity of belief and behavior—especially on the part of the Muslims. One of the recurring themes is that of world conquest commanded by Allah. Muslims justified all of their wars and depredations during this immense stretch of history by referring to the Koran and to the words and deeds of Muhammad. Muslim leaders did not look upon their conquests as simply local affairs, but as stepping stones to subjugating the earth. Thus, two common refrains across the centuries were “we will stable our horses in Constantinople” and “we will stable our horses in Rome”—and this from warlords who may have been more than a thousand miles distant from either Rome or Constantinople. When, in 1786, Thomas Jefferson and John Adams inquired of Tripoli’s ambassador to Britain why the Barbary States preyed on American shipping, they were informed that according to the laws of their prophet, Muslims had a “right and duty” to make war on all nations that did not acknowledge their authority. Another constant over the centuries is what Ibrahim calls the “win-win” bargain. Whether a Muslim lived or died in battle, he was guaranteed a reward either way. If he survived a raid or battle he would be rewarded with plunder, slaves, and concubines. If he died, all his sins would be forgiven by Allah, and he would be saved from the tortures of hell. In addition, he would be rewarded in paradise with food, drink, and seventy-two “eternally young” virgins (houris). Indeed, Muslim officers and preachers would circulate among the troops before battle, reassuring them of their immortal rewards should they die in battle. Many early chronicles attributed Muslim zeal and fanaticism in battle to the “win-win” incentive. Still another constant was slavery. One modern historian observes that “the Islamic jihad looks uncomfortably like a giant slave trade.” The number of the enslaved was astronomical. It was not unusual for a campaign to result in the enslavement of 100,000 people. Between 1530 and 1780, the Barbary Coast Muslims enslaved at least a million Europeans. Some three million Slavs—Poles, Lithuanians, Russians, and Ukrainians—were enslaved between 1450 and 1783. Millions more were taken captive by the Muslim conquerors of Spain. One caliph, Abd al-Rahman III, had 3,750 slaves and 6,300 concubines. Slaving raids were also carried out in Ireland, England, Denmark, and as far away as Iceland and Scandinavia. Slaves were used for labor, as soldiers, and as concubines. White slaves were highly prized, especially blonde and red-headed girls and women. Black slaves were routinely castrated. Although few Americans are aware of the fact, the Arab and Ottoman slave trade lasted far longer than the Atlantic slave trade and resulted in the loss of many more lives. Even America did not escape the reach of Islamic jihad. In its formative years, as Ibrahim points out, America was forced to make jizya payments—amounting to 16 percent of the federal budget—to Algeria for the release of captured American sailors. Indeed, America’s first war as a nation was a war against Islam. 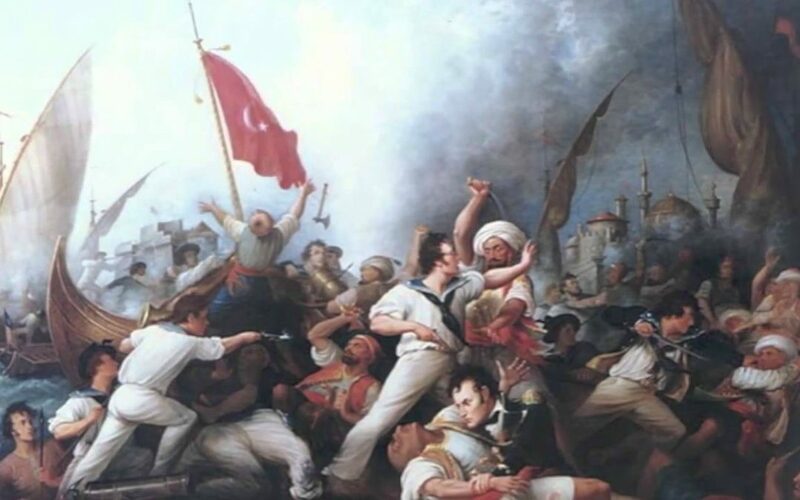 Over a period of thirty-two years, the American navy fought an intermittent war to put an end to the Barbary States’ attacks on American shipping. That is what is referred to by the “shores of Tripoli” in the Marine Corps hymn. Sword and Scimitar puts to rest several important myths. One of these myths is that Christians were the aggressors in this long and bloody conflict. This is decidedly not the case. For example, the modern idea that “the crusades were unprovoked wars of conquest” is demonstrably false. As Ibrahim points out, the crusades were a very belated response to 400 years of Muslim conquest. Two-thirds of the Christian world had already been devoured by Muslim armies before Pope Urban II made his appeal to the knights of Christendom. Many regions which are now solidly Muslim were once Christian. All of the twenty-two nations which now comprise the “Arab world” in the Middle East and North Africa were Christian. The same is true of Turkey, whose capital, Constantinople, was once the center of Christendom. The historical record also reveals two perennial weaknesses of the Western response to Islam. One is disunity. There were several cases of Christians failing to come to the aid of other Christians. And there were even cases of Christians taking the side of Islam. Protestant Queen Elizabeth I formed an alliance with the Barbary pirates against Catholic Spain, and Protestant Count Tholky of Hungary actually marched with the Turks against Catholic Vienna. Likewise, some Catholic rulers had more interest in fighting other Christians than in fighting the Turks. According to one historian, King Charles V “would spend more time, money, and energy fighting the French and the Protestants than he ever devoted to the war with Suleiman.” More shamefully, Louis XIV supported the Ottoman siege of Vienna with men, money, and engineers. When Jan Sobieski’s victorious army inspected the field of battle, “a great many French” bodies were found alongside the Turks. Let them not think that they are protected against invasion, those who are at a distance from the theatre of war! They, too, will bow the neck beneath the yoke…unless they come forward to meet the invader. Can’t happen in the here and now? As Sword and Scimitar ably demonstrates, what has happened over and over in the past is very likely to happen again. This article originally appeared in the August 29, 2018 edition of Crisis.